Thank you for signing up with FlyData, you can access FlyData Console now. To take advantage of the free trial with FlyData for Amazon Redshift, you first need to register with Amazon Redshift. Do this while they’re offering as well a free trial account. Be sure to take note of your login and other information on Amazon Redshift. 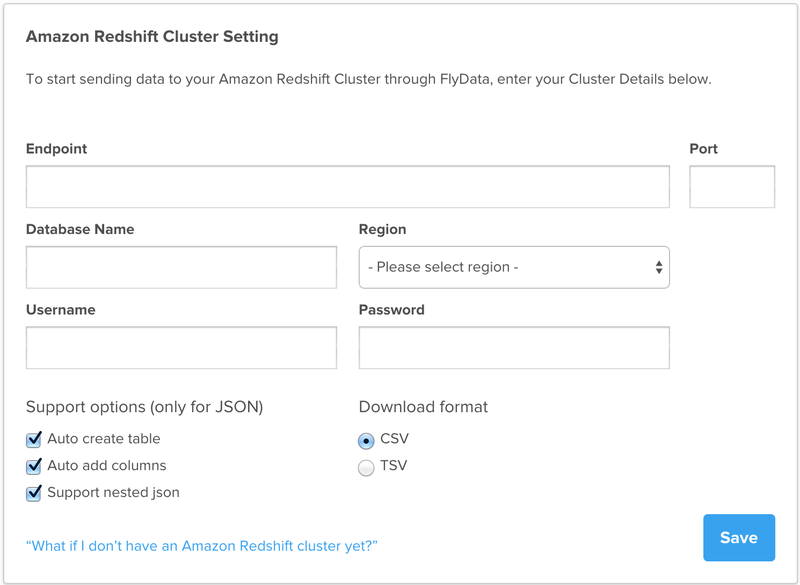 You’ll need that for when you register and configure FlyData.Once you’ve done that, launch an instance of Amazon Redshift on your system to begin the process of setting up a system with FlyData. That’s all you need to do at this stage to authorize FlyData access to your cluster. 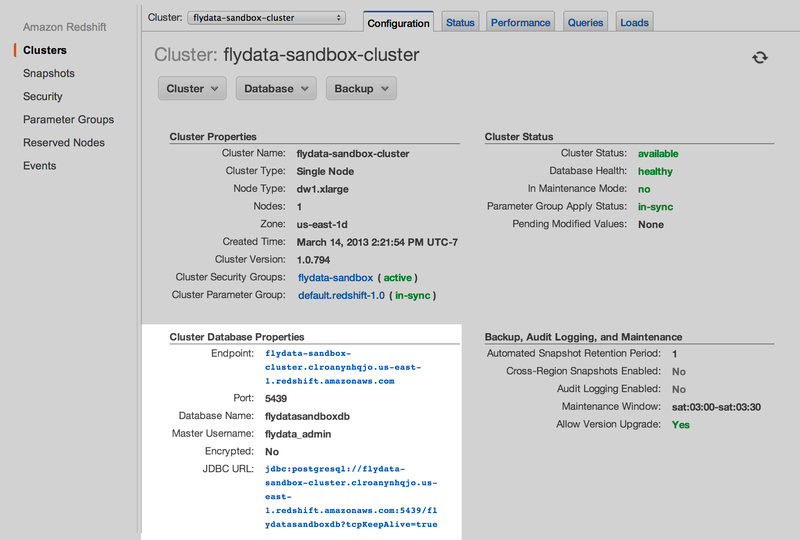 Skip to the section below called, Register Cluster with FlyData. In the previous section, you were asked to enter the information about FlyData’s servers in your security setttings with Amazon Redshift. This way FlyData is authorized to interact with your cluster. 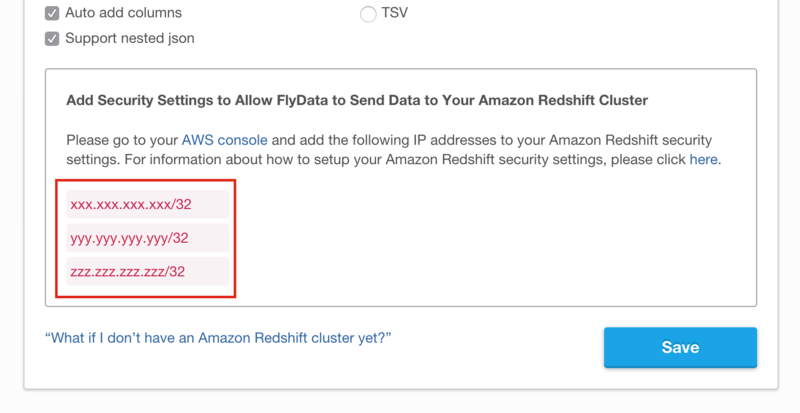 Now you need to enter information about your Amazon Redshift cluster connection on the settings page with Flydata. Endpoint : Redshift Cluster endpoint. Port: Redshift Cluster port (default 5439). Database Name: Redshift database name. You will need to use your endpoint and port. For example, the endpoint might be set to something like, myredshift.cywlg1ayhkjv.us-east-1.redshift.amazonaws.com, with the port set to 5439. 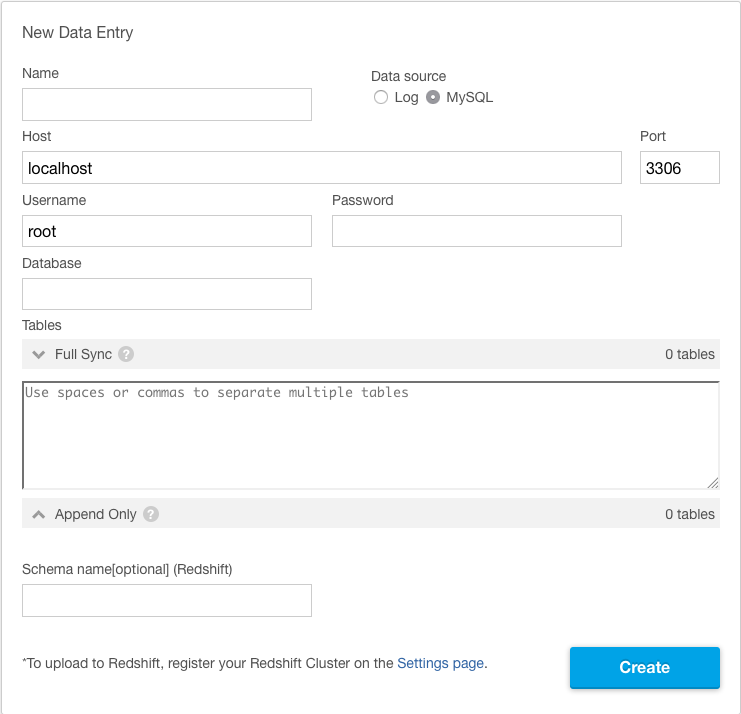 For the database name, you’ll have to enter the name of the database that you want replicated on your Amazon Redshift cluster. You’ll also have to provide the MySQL user name and password for accessing the database. The point of FlyData Sync in particular, is to replicate selected databases and tables on Amazon Redshift. To do this, you will need to register Amazon RDS MySQL on FlyData. You will also need to make sure the binary logs are enabled on your MySQL server. Let’s do that first. Next you need to create a read replica. 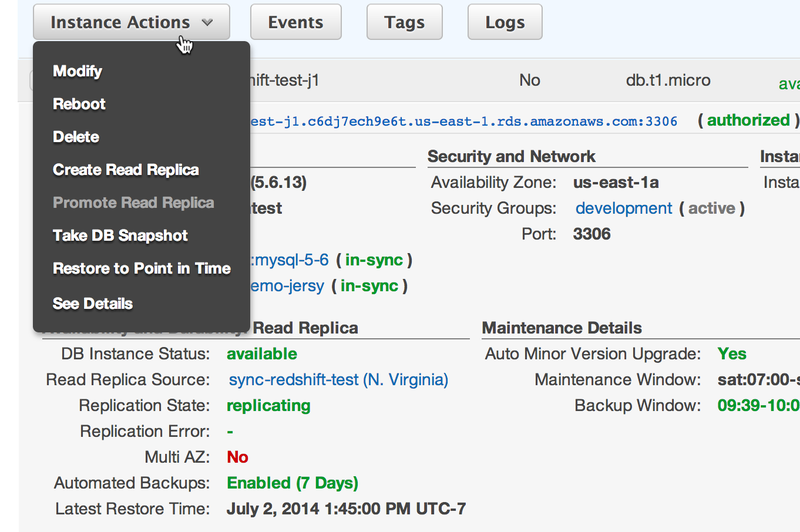 Do this in your Amazon RDS Dashboard. Select Instance Actions and then Create Read Replica. A dialog box will appear asking you to set parameters for the group. * If your Read Replica is MySQL 5.7, you also need to edit following parameter. When you’re finished, click Save Changes to save your changes. You need to enter a password for the New Master Password so as to reset the default parameters. User may use the same password as you used previously for the master password. You don’t have to change it, but it needs to be entered again, although it says New. For the DB Parameter Group, enter the name of the one you just created. When you’re finished entering these parameters, Select Apply Immediately and click on Continue. When asked for confirmation, click on the button labeled, Modify DB Instance (see screenshot below). Now that you’ve modified the instance, wait until it becomes available again before proceeding. Enter the connection information related to the read replica in data entry page on the FlyData Dashboard. To do this, go to the New Data Entries table in the FlyData Dashboard. Then choose MySQL as Data Source. Be sure to include the name of a database and tables to synchronize. Host: RDS DB instance endpoing (MySQL Server host). Port: RDS DB instance port (default 3306). Username: the name of RDS user (in this document, `sync`). To install the FlyData Agent, you will need a Linux server, which has access to your MySQL server. If you don’t have a server already, you can launch a new EC2 instance in your AWS account with the following steps. If you already have a server on which you can install FlyData Agent, you may skip to the next section. You will need an encryption key pair to log into the EC2 instance. You may use an existing one for the server or you could create a new key pair. Once you have one, though, you will need to know where it’s located on your server. From the AWS Console, select EC2. Click on Launch Instance and then click on Select to choose an Amazon Machine Image (AMI). To finish, click on Review and Launch and then Launch. You would replace public_key with the path and file name for your public key. It might read something like, ~/.ssh/foobar.pem. The instance-public-DNS would be the specific internet address for your instance. It would look something like, ec2-23-20-136-106.compute-1.amazonaws.com. You will need the exact command for your system. So copy the install command from your Dashboard and execute it on your Linux server. This uses the FlyData Agent to provide the needed table definition script. 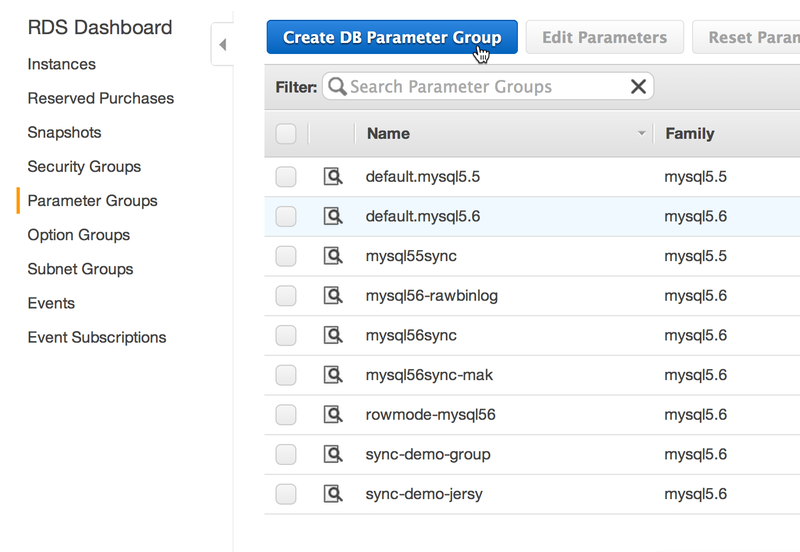 Copy the output and run it from FlyData’s Amazon Redshift Access Console. The installation and configuration is finished. You need only to start the FlyData Agent on your server. This agent will extract data from the MySQL binlog on your server, and send it to Amazon Redshift for storing and processing. 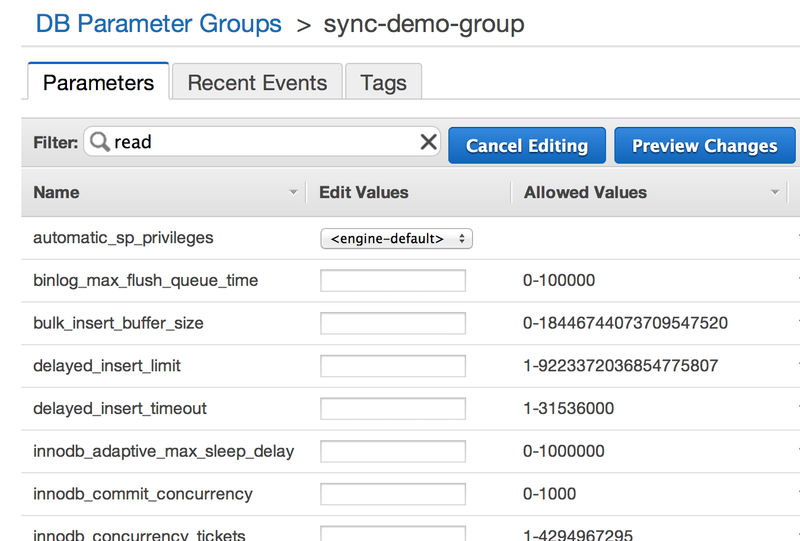 At this point, whatever tables you’ve created on Amazon Redshift’s cluster should be populated and kept in sync. If you want to be sure, run some SELECT statements on some of the tables on both systems and compare the results. 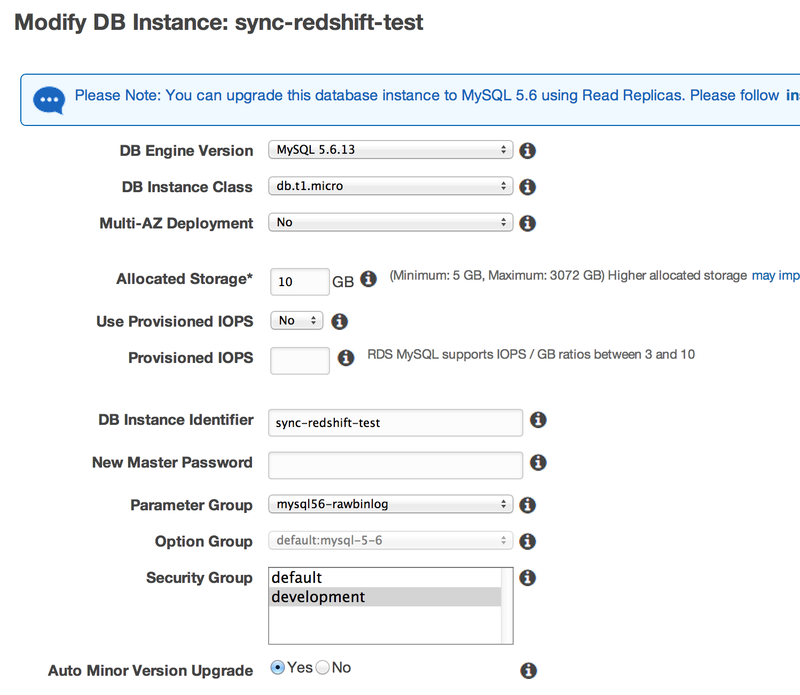 Add or change data on your server and see if it updates on Amazon Redshift. It may take as much as five minutes to synchronize, but it should work just fine. To fetch changes from your MySQL tables, you can have FlyData directly monitor changes to your database. Alternatively, you can install the FlyData Agent onto a Linux server that has access to your MySQL server. While the first choice requires you to open your MySQL port to FlyData, it simplifies your process and you can save on server costs. As this is a new addition to our service, please contact us if interested. Otherwise, please follow the steps below for the second option (installing the Agent). You will need a encryption key pair to log into the EC2 instance. You may use an existing one for the server or you could create a new key pair. Once you have one, though, you will need to know where it’s located on your server.